Some people’s favorite room in their home is their kitchen or a beautiful bedroom. 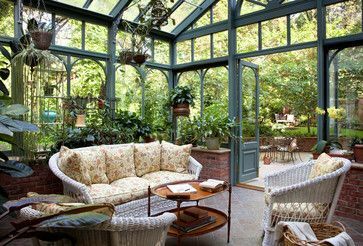 However, a home with a sunroom instantly makes me swoon. It doesn’t matter the weather it is a rainy fall day or a sunny spring evening, I want a book, glass of wine, and I will talk to you later. 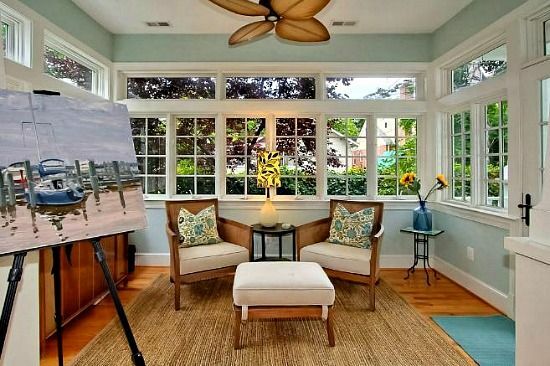 If you have a sunroom, I am jealous. Which is why I present you with some of my favorite Sunroom Decoration Ideas. 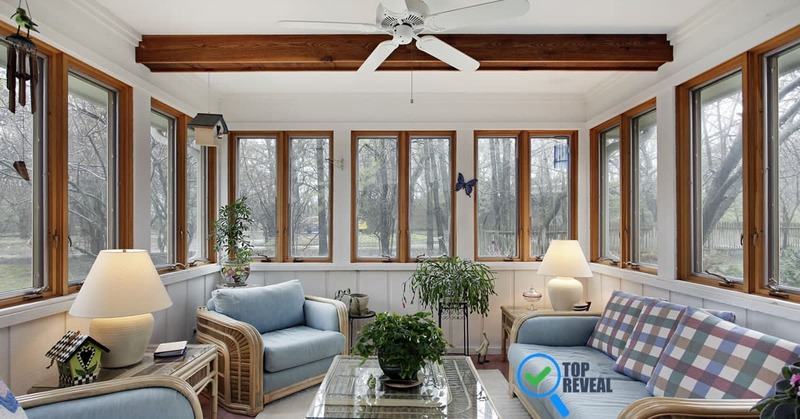 Sunny Sunroom Decorating Ideas: Which one do you like the best? 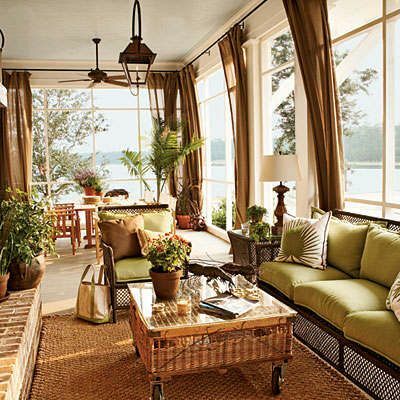 1 Sunny Sunroom Decorating Ideas: Which one do you like the best? 1.19 Bring in All The Plants! A sunroom is a perfect place to store all of your tender plants that need a bit more care. Keep those unique photos and cool pillows, to create a one-of-a-kind room like this one by Country Living. 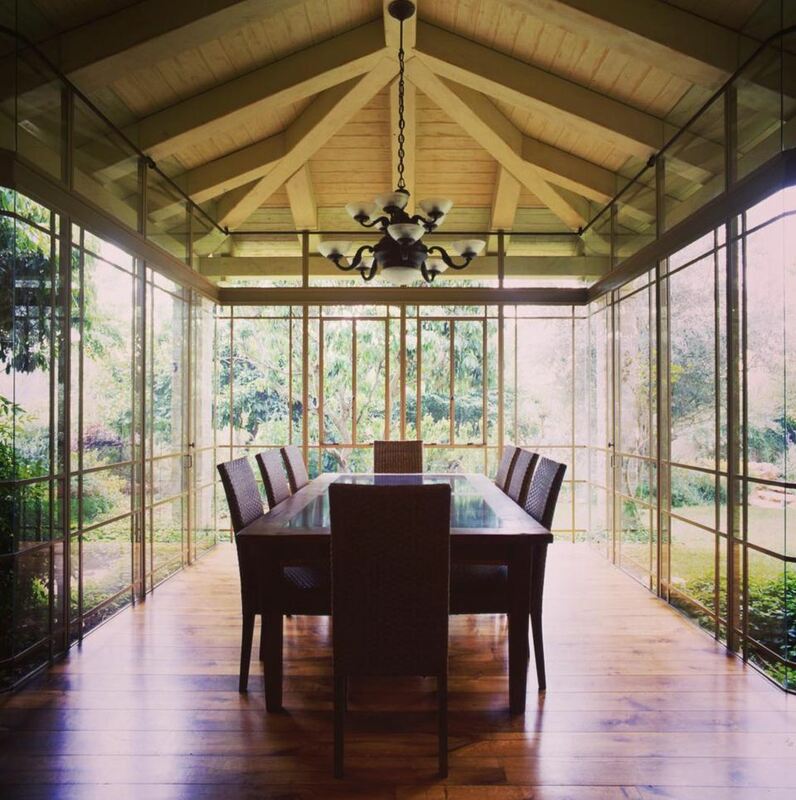 If you have a bit of control over how you build your sunroom, consider all windows like you see here from this Instagram pic. This will allow for maximum sunlight, while still being able to beautifully decorate. 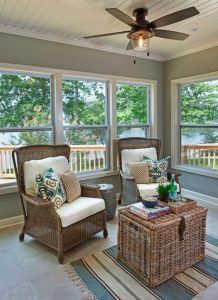 When decorating your sunroom focus on filling it with light colors or pastels like you see here from lushome. It will create a beautifully fresh look throughout the entire room. A bench, like the one seen here via Estilo & Deco can be a simple way to decorate some of your sunrooms without having to purchase expensive furniture or take up a lot of space. If you have space, set up your sunroom as if it were another living room like the people at Architecture Art Designs. This can be an excellent space to talk with guests or visit with the family at the end of a long day. No room on the walls for art? No problem if you take a page out of The Pink Pagoda’s book. A rug can be a beautiful piece that will add some color and contrast to a sunroom. 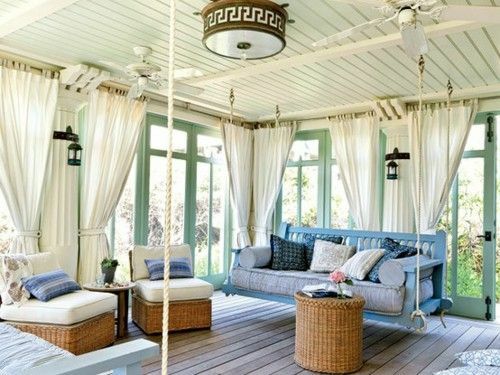 A sunroom doesn’t have to be enjoyed only when the sun is out! Rain, overcast, or even nighttime can create the perfect atmosphere for some time in your sunroom if it looks like this one on Dominos. Create the perfect atmosphere for a tropical escape with this design on Between Naps on the Porch. Open those windows, fill your wicker chairs with some beautiful pillows and pour yourself a cocktail to suddenly find yourself on vacation. 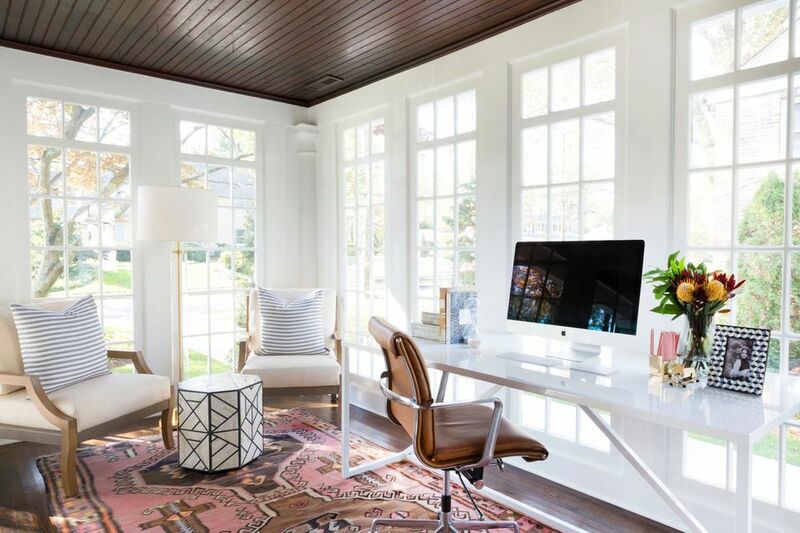 A sunroom can also be the perfect space for an office. If you work from home this setup can be an excellent spot to feel like you work outside, while also getting a little vitamin D.
There are many ways to decorate your space. One way is to add a chandelier like Atlanta Homes! 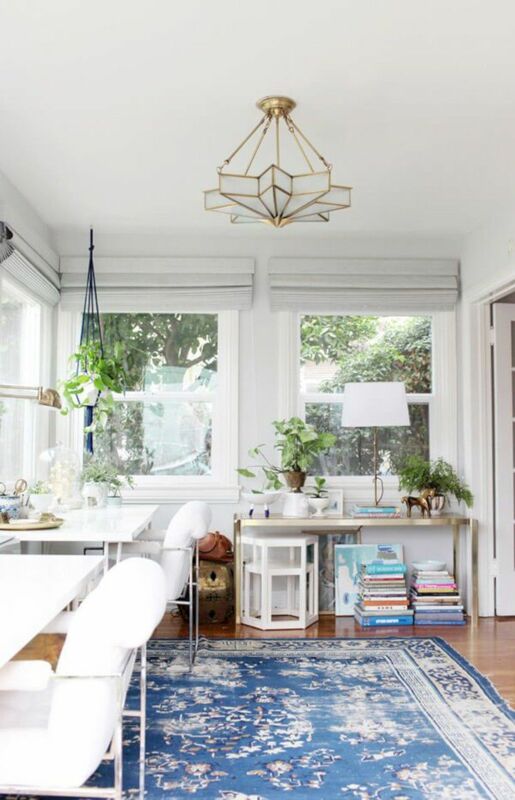 Chandeliers are not just for dining rooms and entryways. They can be the perfect touch to any room, by creating just a bit of an upscale eclectic look. A swing or hammock like the ones on Architecture Art Designs is an excellent way to relax in the sun, but they aren’t just for front porches or your backyard. Add one to your sunroom to lounge whenever you please. 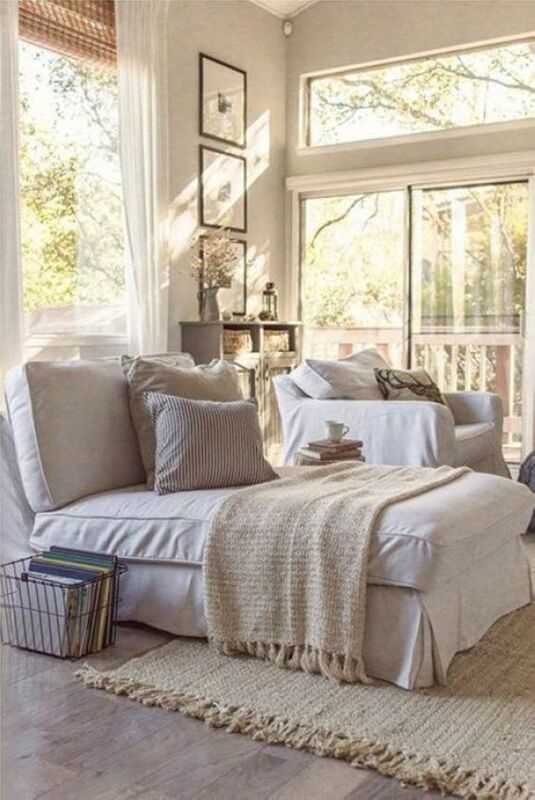 By adding a day bed or lounge chair like Homenimalist you are creating the ideal spot to take a nap. Which is no problem in my book! 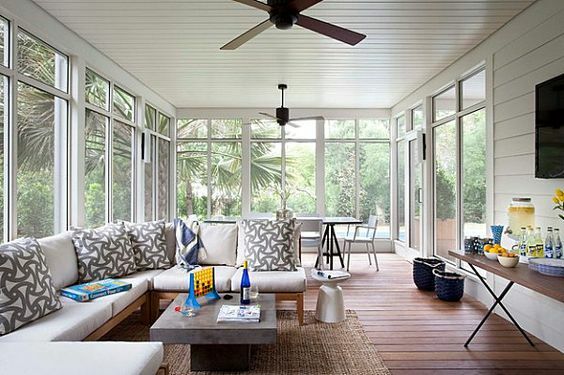 A sunroom can be a fun spot to enjoy game night if you set it up like Decoist. Sip some drinks and get competitive just as the sun sets while feeling like you are enjoying the outside at the same time. For an intimate feel like you see here by Nellie Bellie add a fireplace to make it feel like you are always outside. Even when the weather is bad or the mosquitos are particularly hungry. 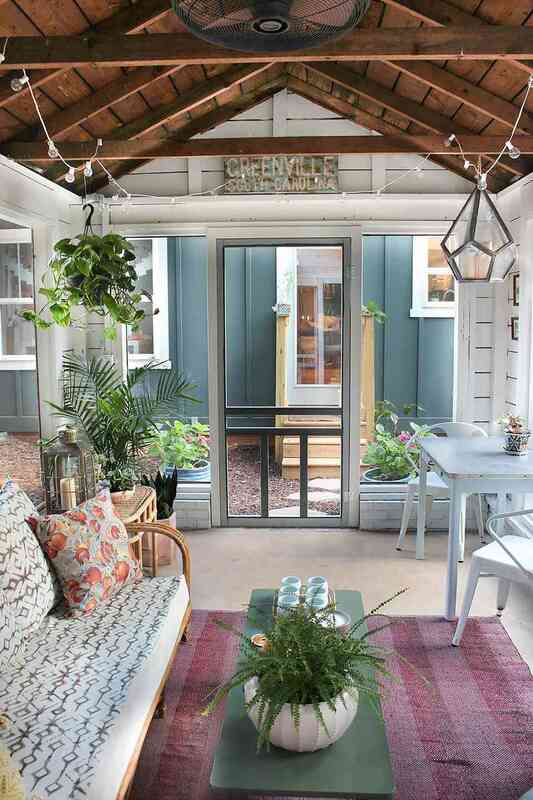 A lot of sunrooms we have seen are nice living room type spaces, but you can go the complete opposite direction and create a sort of green room or gardening space like this one from Sommarbaracka! Bring on the dirt and the plants! 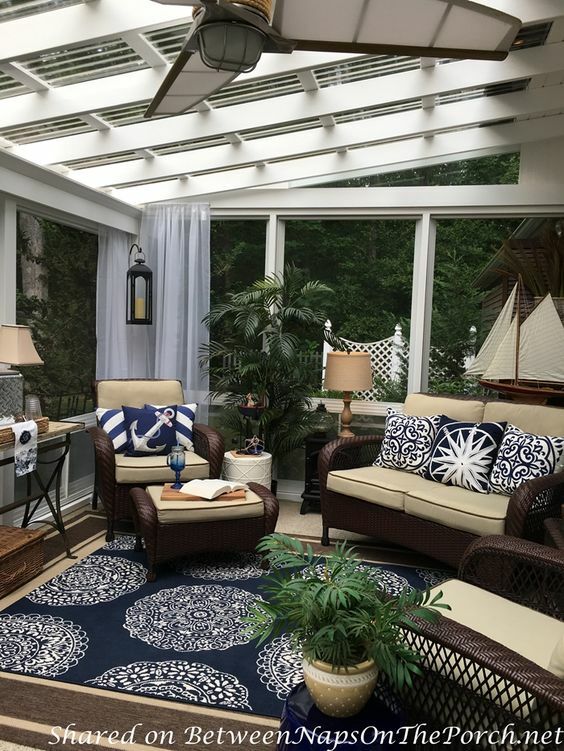 Design your sunroom with a nautical theme thanks to this pic by Between Naps on the Porch. Even when the weather is not nice enough to relax by the sea, you can feel like that salty water is only a few feet away. This idea via Walk Among the Homes can be an especially great space for your little ones to play if you live in an area that gets a lot of rain. Allow them to feel like they are outside no matter the weather. A sunroom can become especially toasty on those warm summer days, so consider putting a ceiling fan in like the one seen here from Happy Holiday 21 . Especially if your windows do not open! Bring in All The Plants! 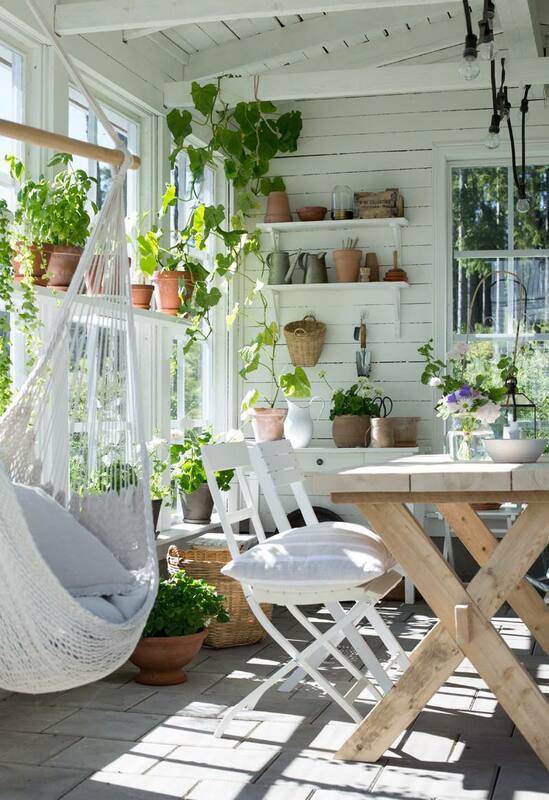 Fill your sunroom with tons of plants like the ones seen here on Huffington Post. It will give the room a beautiful fresh scent and create a very beautiful look. 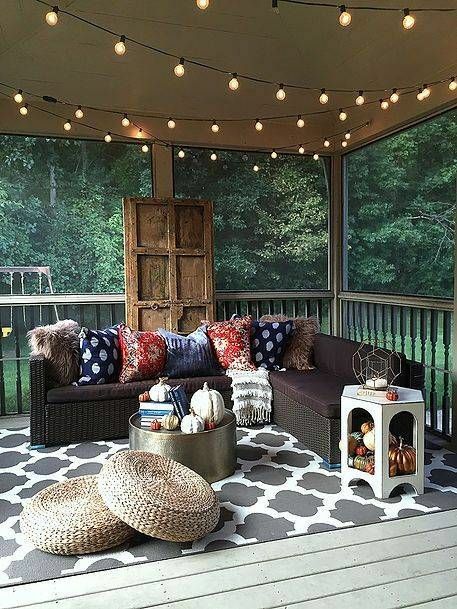 Don’t have a sunroom? 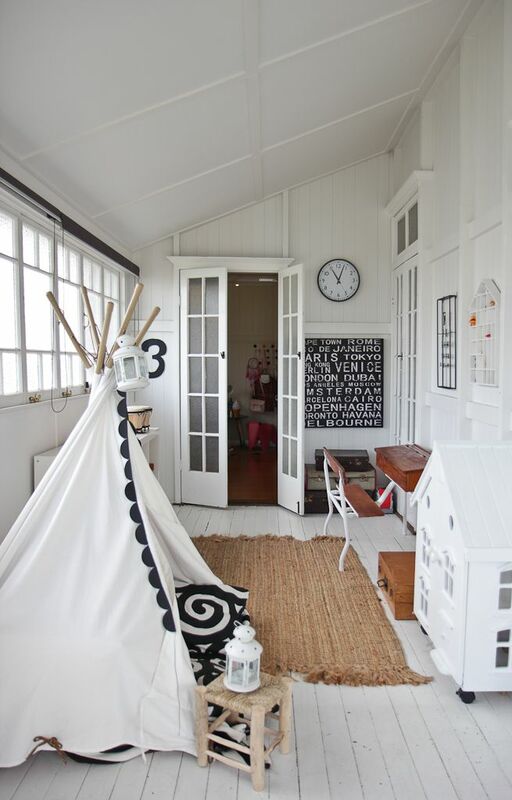 Turn a shed into one like the White Buffalo Styling Co. did! It may not be a large space, but it can be just enough to create a relaxing environment. 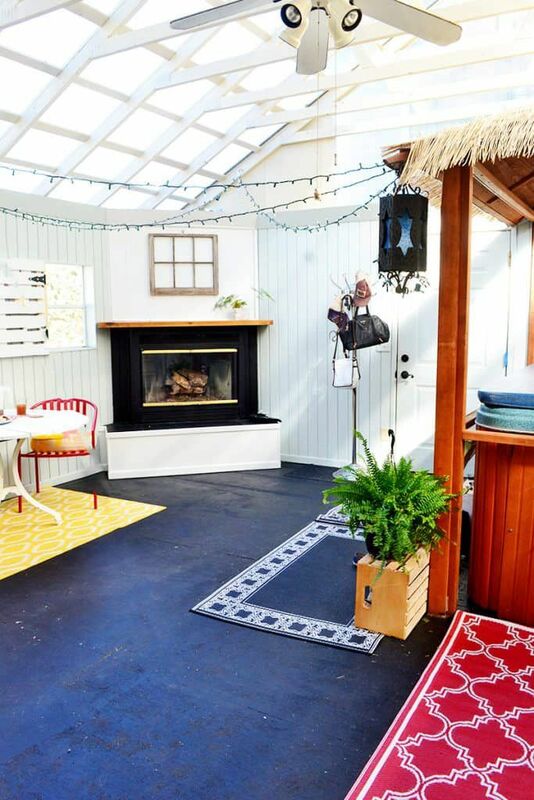 Design your sunroom for creativity and painting using this setup from Urban Turf! Set up an easel or a space that is so pretty you just cannot help but paint! 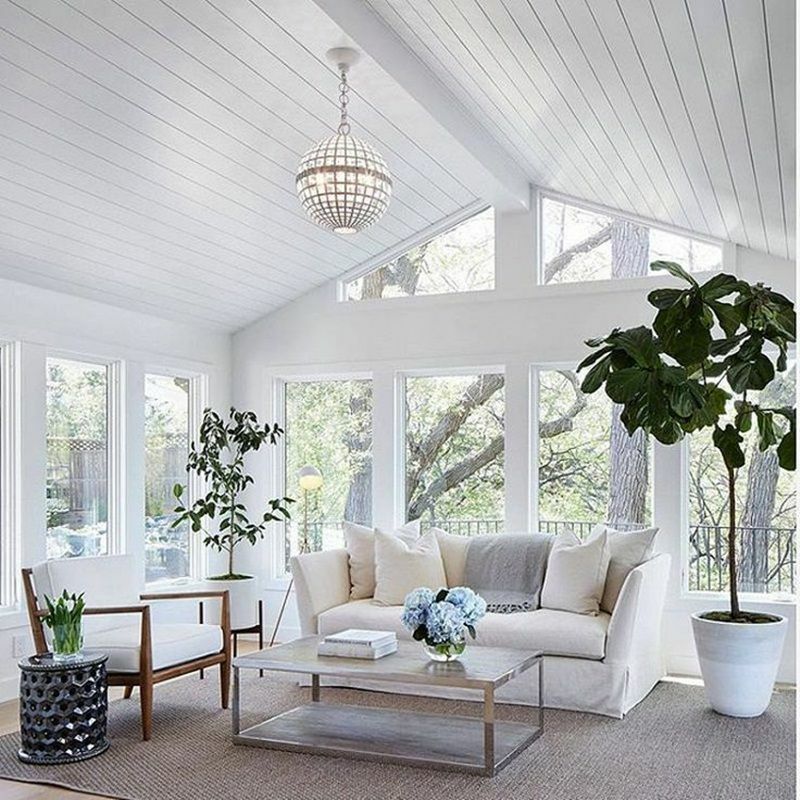 A pop of color like the white shown here on Instagram can be a beautiful effect, especially in a sunroom. Stick to a few neutral colors then add bold pops of green, red, or yellow! 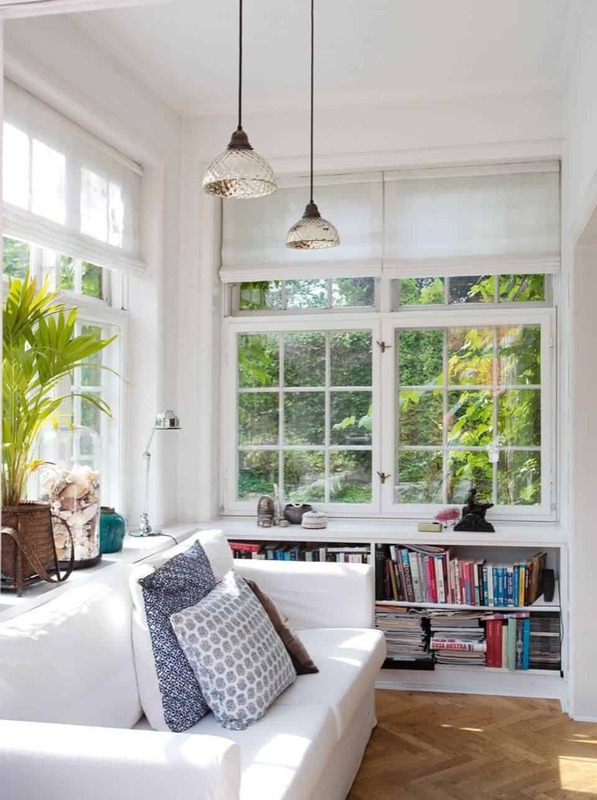 A sunroom like this one from Boligmagasinet can be an excellent spot to read. Simply place your seating to allow for maximum light and fill the room with a few bookcases to store all your favorite reads. Did you enjoy the list? If so share it with a friend and let me know what you think in the comments. 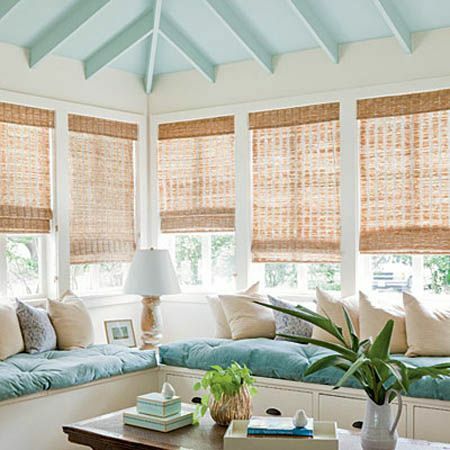 As you can see, there are so many ways to decorate any sunroom to make it your favorite room in your home.